Much of the “vintage retro” look has come from 1940s day dresses. The design is classic; knee length a-line skirt, button down blouse top with modest sleeves, and a figure flattering nipped in waist. The 1940s shirtwaist dress became an icon of the decade and has never left fashion again. There was even a 1980s and ’90s revival of the 1940s day dress look. So what does a 1940s day dress look like? Short or Long Sleeves- Dresses in the early 40’s had sleeves that ended just above the elbow or mid forearm. Except for the Kitty Foyle style dress, sleeve did not have cuffs. Many dresses in the mid 40’s started showing very small sleeves called cap sleeves. These were cut with the dress bodice and required no additional sewing other then a simple hem. 1941 House dresses in small print, high collars, and vertical pleating. High neck line- A 1940’s day dress had a neck line that is modest by today’s standard yet revealing for the times. An opening came in square, heart, or v shapes. Dresses of the 40’s often had collars like smaller versions of those on men’s dress shirts. This is a trademark design of 1940’s dresses. A high neck line brought attention to a women’s face which was simply accented with makeup and very neatly styled hair. Square shoulders- Shoulders are squared off in both dresses and blouses. You could draw a straight flat line from the collar to the end of the shoulder and then straight down the arm. This “squared” corner shape was later brought back into the 80’s. Both decades used shoulder pads to make shoulders square. Fitted bodice- The bodice of the dress were very snug. From the square shoulders to the tiny waist the shape looked like an upside down triangle. Some fancier days dresses had pleats and gathers that formed a “wrap” dress bodice. More casual dresses had an apron front- an apron sewn over a dress-or at least the illusion of one. The most common day dresses were shirtwaist style. They were not zippered in the back instead they were buttoned straight down the front of the bodice and often down the skirt too. Knee length skirts- Dress skirts went down to the low knee cap. Hemlines had to be very straight and neat otherwise a lady would look shamelessly sloppy! Skirt shapes were A-lined with no pleating until after the war. They fit slightly loose, not “pencil” till the late 1950’s. Fabric and Trimming- Wool or cotton was the most common fabric choice. Easy to care for, comfortable in all weathers, and lasted a long time. However, Rayon was the hot new fabric and more and more day dresses were being made with this “new” synthetic. Colors were not that interesting. The war kept choices limited to subtle blue gray’s, medium browns, and faded greens. The post-war years had more bright colors and patterns to choose from. 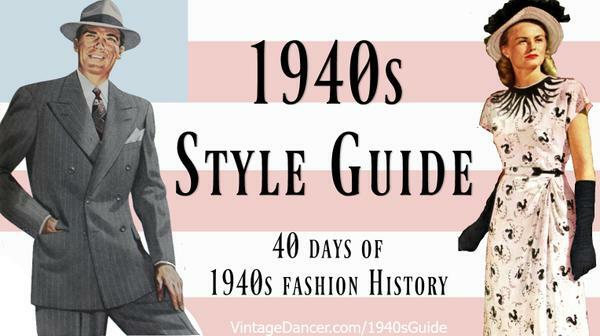 See more fabrics and colors of the 40s. 1948 summer cotton fabrics in small prints and solids. Early years prevented any fabric adornments like pockets and bows. The later 40’s had many of these extra fabric trims. That completes the typical 1940’s day dress. There are 100’s of vintage, new and reproduction clothing stores that sell 1940’s day dresses. To make your search easier visit my 1940’s dress shopping page to find the perfect dress for you. Plus size gals, don’t worry, there is a shopping page just for you. I wanted to write a fiction book and base it in the 1940’s and this site helped sooooooo much with the fashion. Thank you and please continue work. Нашел в интернете полезный интернет-сайт с информацией про Примоболан.